In-line water filters installed on your icemaker water supply line can remove bad taste and scale from your ice as well as protect the water inlet solenoid valve, saving on annoying and costly repairs later on. But did you know they should be changed every three to six months? Yes, my icy grasshoppers, it is true. As the filter removes the impurities from your water, it not only becomes saturated with those very impurities, but it is transformed into a veritable metropolis for bacteria. These little creatures multiply and grow to such an enormous extent that they actually begin to clog up the filter with their dead corpses. New little bacteria babies begin living and feasting on the rotting corpses of their fallen parents and cousins, clogging the filter, causing low water pressure, and the resulting hollow ice cubes. At this point in the filter’s life, millions of dead and living bacteria, the mixture variously called scum or puss, normally not visible but in extreme cases may cause the ice cubes to appear cloudy, begin sloughing off and traveling with the water to your icemaker. As you use the ice, you ingest these little creatures where they attempt to make their new home deep inside your intestines. The results could range from simply bad tasting ice, to a feeling of a sour stomach, to mild nausea, to violently vomiting up the entire contents of your stomach along with much bile and other slimey secretions. PureSource Filter – for Frigidaire refrigerators equipped with PureSource water filtration systems. SmartWater Filter – for GE Water by Culligan filtration systems. 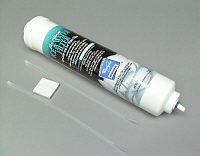 Water Filter Assembly – for Whirlpool models where the filter is inside the refrigerator. Ice and Water Filter – for Whirlpool, KitchenAid and Kenmore refrigerators where filter is in the front grill. Handi Plumb Filter – for ice makers that were added on to any brand of refrigerator. If you don’t see yours listed above, come browse the complete selection of icemaker water filters. Ok, go buy your icemaker water filter now and don’t forget to change it at least every six months. This entry was posted in Ice Maker Repair, Refrigerator Repair on August 11, 2003 by Samurai Appliance Repair Man.